Elijah (Gk. form, 'Elias') (9th cent. B. C.) is traditionally held to be the greatest Hebrew Prophet. 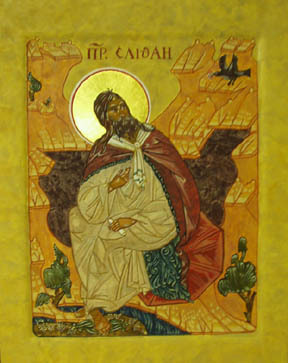 The Prophet Elijah in the Wilderness is one of several Old Testament Icons. "So he went and did according unto the word of the Lord: for he went and dwelt by the brook Cherith, that is before Jordan. And the ravens brought him bread and flesh in the morning, and bread and flesh in the evening; and he drank of the brook." I. Kings 17, 5f. 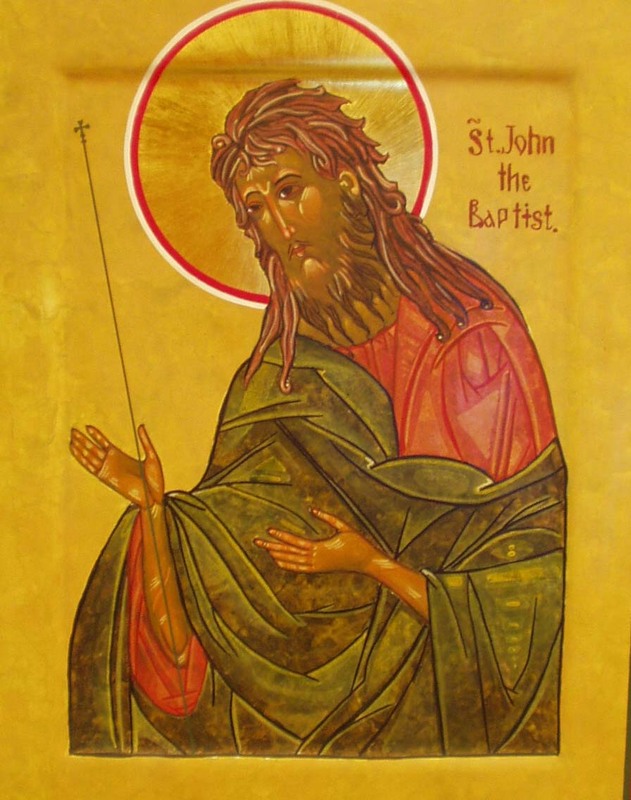 John the Baptist is considered the 'Forerunner of Christ'. In his life he denied that he was Elijah, but the Lord was understood to have accepted the identification (Mt. 17.13). He has unkempt brown hair and beard and an intense expression in his eyes, appropriate for a mission preacher on the banks of the river Jordan, "...saying, Repent ye: for the kingdom of heaven is at hand." Mt. 3,2. He is wearing a simple tunic and cloak, but in other icons he can be seen wearing a camel hair cloak and may have wings like the archangels. His arms are unnaturally thin. In this icon he holds a staff symbolizing him as the messenger of God's new covenant. The prophet Eljah looks like the Baptist but much older, with the same intense expression.